Are you thinking about bringing home a new puppy? If so, you should consider adopting a puppy from your local animal shelter or rescue. We adopted our little Linus from the animal shelter over 8 years ago and it was perhaps the best decision we ever made! Every year we try to support our local animal rescues and shelters by visiting, donating, and volunteering our time at the large pet adoption events. We’ve volunteered as fosters for puppies and dogs for Cuddly Canines Rescue. And of course we always like to share pictures here on the blog and at our Facebook page of adoptable pups and dogs from the adoption events we attend. There are a lot of misconceptions about rescuing a dog or puppy. Here are a few we hear all the time. 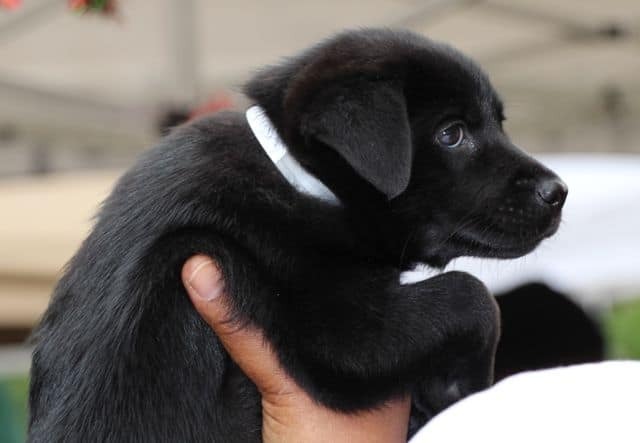 Looks like a black Labrador Retriever mix rescue puppy! There are only mixed breeds at rescues and shelters: The Humane Society estimates that 25% of dogs in shelters are purebred. We love our Aussie, Lab, Husky, Chow mix breed (actually that’s just a guess) Linus, but there are plenty of breed specific rescues out there too. Just go to PetFinder.com and search for your breed of choice. They don’t have purebred puppies – While it may be more difficult to find a purebred puppy of your choice we do see them all the time at rescues and shelters. I’ve seen litters of purebred Labrador Retrievers and German Shepherd puppies recently up for adoption. I also saw a litter of Labradoodles (technically not a purebred, but a very popular hybrid cross) up for adoption at PetFinder.com a few days ago. So now that you know that there are puppies even purebred puppies available at animal shelters and rescues what are the 7 reasons why you should adopt a rescue puppy? 7 Reasons Why You Should Adopt A Rescue Puppy! A rescue puppy will change your life! Every day I see the popular paw print bumper sticker “Who Rescued Who?” It’s so true! First of all, a puppy won’t just make you more social it will make you the most popular person amongst your group of friends, family, neighbors, and even strangers. Trust me, as a puppy foster and guide dog puppy raiser everyone becomes your best friend. A second benefit is as your puppy gets old enough to go on walks through the neighborhood you’ll notice that you talk to your neighbors a whole heck of a lot more than before you had a puppy. Check out this study on stress relief and pets. Just in case you don’t want to click through to that article recent studies have shown that spending time with your pet may be a better stress reliever than talking your problems out with a friend! Linus and Stetson are great listeners! A new puppy will help get you more exercise. When they are puppies they probably won’t make great jogging partners, but as they get older they will make at least a good walking partner. Of course as puppies you’ll probably be walking them back and forth to their potty spot in the backyard…also great exercise! Some people have told me that this isn’t necessarily true because who wouldn’t have adopted that adorable puppy? I do agree that an adorable puppy will get adopted, but the longer he stays at the shelter or rescue the more likely other puppies and dogs will not be able to occupy his space in foster care or at the shelter. Please, please, please do not purchase a puppy from the pet store! I’ve heard and read that 99% of puppies at pet stores come from puppy mills. While I’m not sure where this statistic comes from I do know that the percentage is very high. So please, please, please, do not purchase a puppy from the pet store. Adoption fees for a puppy from the animal shelter or rescue are much less than going to a breeder. Many breeders will charge thousands of dollars for their puppies. However, rescuing a puppy like Linus from the animal shelter cost us $37 and that included microchip and his first set of vaccinations. When I fostered for Cuddly Canines the adoption fee was $350 (a bargain in my books), but that included spay/neuter, de-worming, first round of vaccinations, grooming, and microchipping. YES! The Puppy Breath! It’s kind of a stanky, skunky smell, but if you’re a puppy lover I’m sure you already know and love the PUPPY BREATH! There you have it! 7 reasons why you should adopt a rescue puppy! We adopted Linus just over 8 years ago and we haven’t regretted it one bit. Linus is a unique, one of a kind Australian Shepherd, Chow Chow, Labrador Retriever, Siberian Husky, and who know what else mix. We wouldn’t give him up for the world! So how about you? Are you looking to adopt a rescue puppy or have you adopted a rescue puppy in the past? If so, tell us your story in the comment section below. Thank you for this article! My family has been owned by 3 dogs in my lifetime and they have all been rescues. We even adopted a purebred Cocker Spaniel out of our local no-kill shelter. Next weekend we’re bringing home our first ever puppy. She’s a Miniature Australian Shepherd/Beagle mix. So I’m really glad I found this site! TONS of useful information! Thank you for rescuing! I hope everything is going well with your new puppy. Good luck with your puppy training! Great post Colby! Rescue dogs make great pets! It’s too bad others miss this simple truth. Six years ago we adopted a Chocolate Lab from a local shelter and have had the best four legged friend a family could ask for! I would highly recommend anyone looking for a pet to start at the local animal shelter and save a life. Well said! Linus is has been my best buddy for the almost 9 years now and it all started when we made the decision to rescue from the Animal Shelter. We just recently adopted a 6 week old lab mix pup from the shelter. When we were looking at him/playing with him there he had tons of energy. He was neutered before coming home with us and 3 days later he sleeps all day except to go out to potty, drink and eat. Should I be concerned that something is wrong with him? Or is he just recovering from the surgery still as well as the kennel cough he has? Congratulations on your new puppy! If you have concerns about your puppy’s health it is best to bring him in to your veterinarian for a checkup.